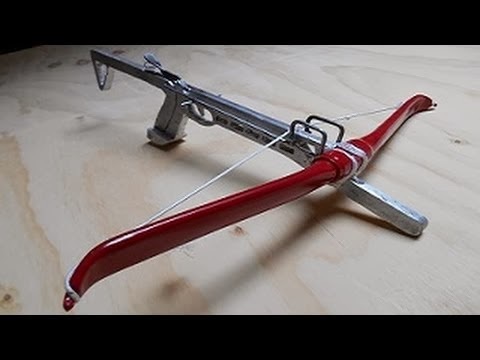 Obviously the crossbow in the video further below is a more sophisticated / modern design than my homemade crossbow. But hey, I can still give credit where credit is due. This particular design works using a lever mechanism in which the person pulls back on the read of the stock and uses the leverage to pull the bowstring back into the cocked position. It also uses a more modern trigger mechanism - whereas my homemade crossbow uses a traditional design that was commonly used during the middle ages. And then there is the obviously differences, wood (oak) vs cast aluminum and PVC. Regardless of the method or materials used, make certain the poundage of the crossbow is legal for hunting if you are intending to hunt with your homemade crossbow.